What the heck is a savings bond? I was so happy when I grabbed the envelope that my dad handed to me. He said something about some money that that my grandmother picked up a while ago…I think. Honestly I wasn't listening after he said money. I'm the 26 year old that still gets hyped up if I get a Christmas card from my relatives with a few bucks in it. Something has to pay for my rising health care deductibles right? Yes, I know that's terrible. I'll work on my morals later. I tore open the envelope and pulled out some 100 dollar…what? I was looking at some pink alien money with an old white guy in the wrong place and a useless old people building in the background. How am I supposed to pay cash for things I can afford with this thing? My grandmother had played me like a fool. It had to be some kind of prank that she thought of back in 1997. At least….that is what the purchase date said on the right hand side. Oh well, an 18 year joke in the making is something I have to flat out respect! I put the happy money back in the envelope and placed it in a dresser drawer. I wanted to forget about getting punked by my grandmother for the foreseeable future. Ok, ok. I knew it was a savings bond when I opened it up. However, my first instinct was to still assume it was worthless. It wasn't green. I figured I might as well go to Walmart and buy a picture frame to preserve it for future gen erations. I let them sit in the dresser for about two months before I randomly decided to open it this week. 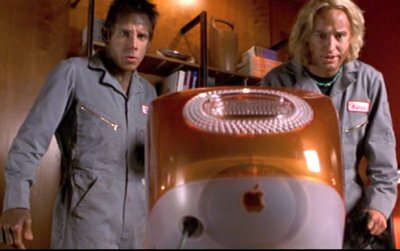 I studied it a little more this time, because honestly I had no idea was a US savings bond was for, or how I break it open and get the cash inside of it like Ben Stiller and Owen Wilson tried to get information from the apple computer in Zoolander. So what is this Monopoly looking money impostor? If you are older than 30 I'm sure you can't believe that I didn't know what my grandmother had purchased for me almost 18 years ago. It's not my fault. I wasn't given a proper money education by the school system, but I CAN take a standardized test on things I literally haven't used since I graduated from middle school. An isosceles triangle has two equal sides and two equal angles. Thank you, Texas. Yes, I am bitter if you were wondering. A savings bond is a loan to the Government that is paid back with interest. You should be familiar with this, because every time you get a tax refund you have loaned the government money interest free! My grandmother spotted Clinton some money for whatever he wanted, and he promised to pay it back with interest over the next 30 years. The loan is fully guaranteed by the US government, and would be repaid even if I lost the bond note. Not bad, Clinton, not bad. 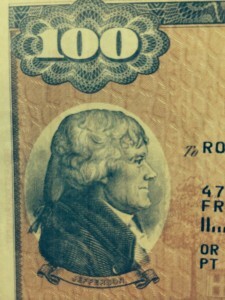 When you go to the bank to cash in the note, it will be repaid at face value plus interest. So why do people invest in these instead of equities? They are safe. Period. Well. Ok. Not worth quite what I thought, but it was interesting to find out that the bond was actually worth $50 at the time of purchase. 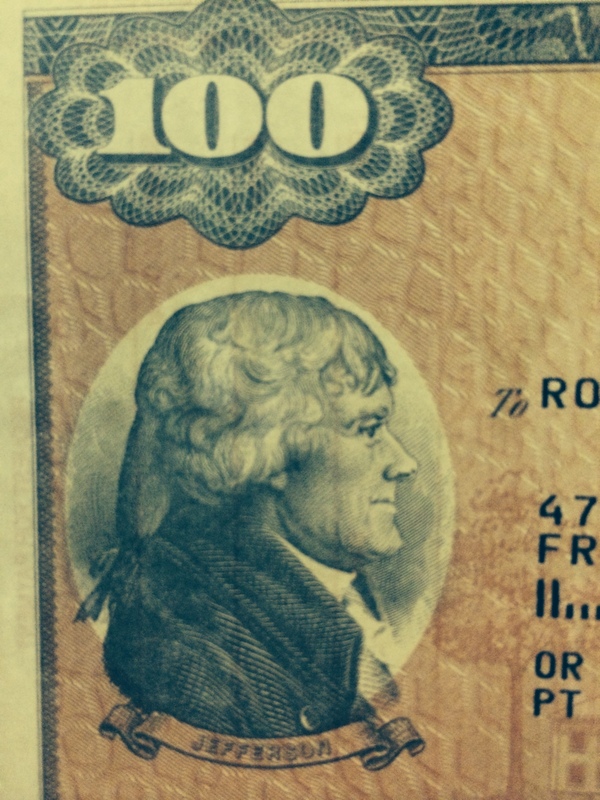 Because it was a paper series EE bond, it was originally purchased for half of it's face value – let me explain. Bonds are guaranteed to double their value in 20 years, and the ones that I received had done it a little bit sooner than that. It's actually a marketing gimmick. If I had bought a $100 bond for $50 in 1997, I only could have sold it a year later for about $52. They weren't worth the number on the front of the bill at the time of purchase! That is why I called bonds alien money earlier. They're weird. 1) A US savings bond gains interest at a variable rate, which changes every 6 months. Back when my bonds were purchased, the interest rate was 5.68%. Today it is 1.49%. Thanks Obama! 2) You pay federal tax on the interest gains after you cash the bond in. 3) A bond will earn interest for up to 30 years. 4) You can sell a bond after one year. However, if you do it too early (before 5 years) 3 months of interest gains will be lopped off as a penalty. Awesome. My bonds have more than doubled in value over the past 18 years, which is better than it losing half it's value. (I am still in the grieving/denial process here, so work with me). I have two bonds, so essentially my grandmother gifted a little over $200 to future Millennial Money Man. A gift is a gift, and I appreciate it. You should too if your parents or grandparents feel gracious enough to give to you for nothing in return. My first Millennial instinct was to get the face value of these things and either put it in my savings account or buy something cool with it. Luckily, I have invested in finding people that are smarter than me. 1) How much interest can it earn? 2) How many years do I have for it to earn the interest? As a young person, I have the ability to leverage my investments with time. Unfortunately, I will continually lose that powerful financial tool as I continue to grow older. This means that I have to act now and be aggressive in my investment strategy. I do not need to worry as much about losing money in “riskier” investments, because I have more time to recover financially than I will ever have again. In my eyes, a bond is too stagnant to be useful at my age. As a young person, “safe” should not be in your financial vocabulary if you want to meet your financial goals. I plan on using that $200 in bonds from my grandmother as well as extra investment capital that was freed up after I paid off my student loans to invest in either ETF's or mutual funds. I may even decide to buy equities outright. Regardless, I do not want to keep the money in the form of low yield bonds any more. I need to take more risk with my investment capital if I want to see better results down the road. I think that you should do this too, and your 50 something year old self will thank me for it! If you receive a bond as a gift from your parents or grandparents, should you re-invest? Don't miss another M$M post. Learn more about attacking debt, making more money, and creating an awesome life you love. Cool post. I had some savings bonds that I cashed in a few years ago to help buy college books and make my rent payment. I wish I had used it for my student loans or a Roth IRA. The Roth is a good idea since you can take out contributions in an emergency, but the money grows tax free. I would start a Vanguard Roth IRA account with $3000 and buy Total Stock Market ETF’s with some savings and bond money. Richard – that is actually something I am considering very strongly right now. I plan to take those bonds, my tax refund, as well as other money that I have set aside for investing and do something very similar with it. (I have a Roth open with Schwab). Thanks for reading! I like it! I had some savings bonds that I cashed in a few years ago. They turned out to be around $300 and I bought my eBay Brooks Brothers wedding tuxedo with the money! I think the family friend who gave them to me as a baby would have been happy with that purchase. Buy a suit, that way you still look fancy for your wedding but can use it again for other dressy events. Renting/buying a tux that you’ll wear less often seems to go against your practical nature. If you haven’t maxed out your IRA for the year (it’s already June), contribute. If you earn less than your available exemptions and deductions, contribute it straight to a Roth. If you earn more, contribute to traditional (see link). As to what to buy, just check your portfolio allocation and buy whatever you need to rebalance. Thanks for the tips. I’m about to roll over my retirement to a traditional and open up a Roth as well. Both will come in handy later down the road. Millennial Money Man may have financial relationships with the merchants and companies mentioned or seen on this site. We are not responsible for any actions taken by users. For more information see our disclosure page. © Copyright 2019 Millennial Money Man. All Rights Reserved.